We report a congenital giant cardiac tumor that occupied the majority of left ventricular cavity with severe left ventricular inflow and outflow obstruction. The hemodynamics were similar to univentricular physiology. He was treated with prostaglandins and bilateral pulmonary artery banding. He had frequent supraventricular tachycardia associated with ventricular pre-excitation that was controlled by long-term administration of intravenous amiodarone. The patient died due to sepsis after 3 months. Primary cardiac tumors in fetus are rare. Sometimes it is complicated by severe obstruction of inflow or outflow of the ventricular tract leading to heart failure ,, and arrhythmia such as supraventricular or ventricular tachycardia (SVT or VT) , and bradycardia due to conduction disturbance. Management for such cases is very difficult. 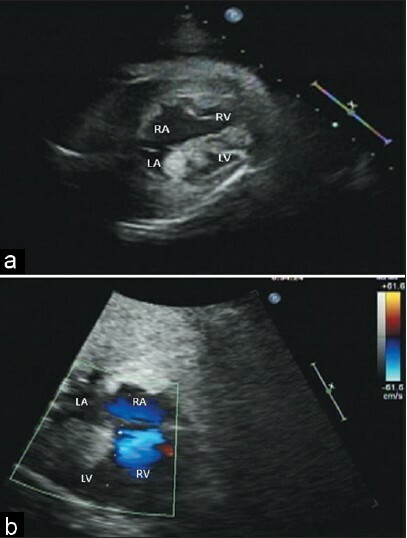 A huge cardiac tumor in the left atrium and ventricle was noted on fetal echocardiography in a 30-week-old fetus. Frequent SVT episodes had been documented since 35 weeks of gestation [Figure 1]. An emergency Cesarean section was performed at 36 weeks of gestation. The baby's weight at birth was 2792 g and APGAR score was 8/8. After delivery, the newborn still suffered from SVT and severe left ventricular inflow and outflow obstruction due to left heart being filled with the cardiac tumor. 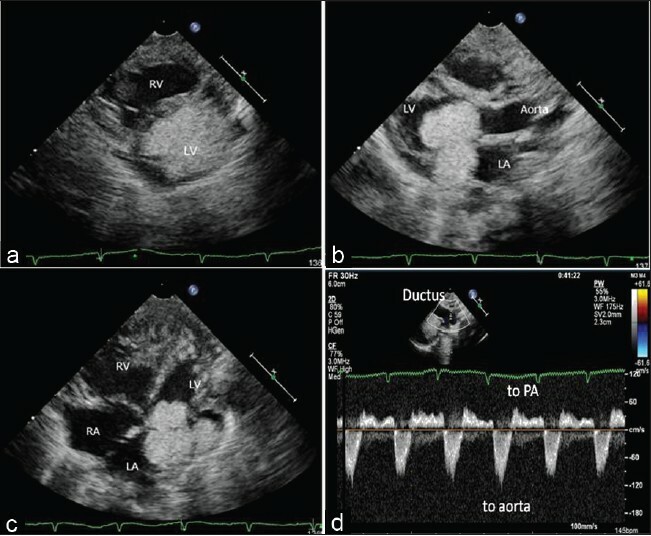 The tumor widely extended from the left atrium (LA) through mitral valve to the left ventricle (LV) on an echocardiogram [Figure 2] in the short [Figure 2]a, parasternal [Figure 2]b, and four-chamber [Figure 2]c views. The tumor size was 21 × 21 mm in four-chamber view. Systemic circulation depended on the retrograde ductus arteriosus blood flow [Figure 2]d, because the tumor occupied the majority of left ventricular cavity and severely reduced antegrade aortic flow. There was atrial septal defect (9 × 9 mm) with bidirectional flow. An electrocardiogram during the sinus rhythm showed pre-excitation [Figure 3]a, the QRS polarity was positive for leads V1 and III, suggesting a left-sided accessory pathway, The SVT [Figure 3]b could be stopped by adenosine injection and the SVT suggested orthodromic atrioventricular tachycardia. The patient underwent bilateral pulmonary artery banding (each banding size: 12 mm) to maintain the systemic circulation at 16 days after birth. Banding size was decided by monitoring of blood pressure, O 2 saturation, confirmed peripheral pulmonary artery blood flow through banding and pulmonary vein flow on perioperative transesophageal echocardiography. A wide surgical resection of the tumor was not attempted to avoid mitral valve injury since the mitral valve was involved in the tumor. After the operation, frequent SVT episodes with hemodynamic instability occurred. The SVT was resistant to intravenous flecainide, landiolol (β-blocker), and nifecalant (Class III antiarrhythmic drug), so intravenous amiodarone was started at a dose of 2 mg/kg, followed by 0.3-0.5 mg/kg/h. After starting the intravenous amiodarone, the SVT had stopped and was effectively controlled. Although the SVT was controlled by intravenous amiodarone, the patients suffered from necrotizing enterocolitis (NEC) resulting in prolonged peritonitis and sepsis. Serial echocardiography showed no spontaneous regression of the tumor. Unfortunately the patient died of multiple organ failure at 3-months of age, and autopsy was not performed. Primary cardiac tumors in fetus and neonate are rare. Most common tumor in infants are rhabdomyoma followed by fibromas and teratoma. In this case, echocardiography showed single rounded large tumor, located in the left ventricular outflow tract, which was homogeneous, diffusely echogenic, and more echogenic than myocardium. There is a good correlation between the images found and histology. We presumed rhabdomyoma is a most probable cardiac tumor in this case. Most of cardiac tumors in the neonate are histologically benign, but sometimes complicated by severe obstruction of outflow tract, arrhythmia, cyanosis and heart failure. ,,,,, In this case, hemodynamically unstable SVT and low cardiac-output due to severe left ventricular inflow/outflow obstruction were the major problems. SVT and ventricular pre-excitation syndrome associated with rhabdomyoma had been previously documented. The previous report suggests cardiac tumor itself works as macroscopic or microscopic accessory connection. SVT in this case was drug-resistant and caused hemodynamic instability. Intravenous administration of amiodarone was effective to control SVT. Because the patient had prolonged NEC, switching infusion to oral amiodarone could not be performed. During the total of 87 days of continuous infusion at a dose of 0.3 mg/kg/h of amiodarone, there was no recurrence of SVT and no significant adverse effects such as hypotension, bradycardia, hypothyroidism, interstitial pneumonia, and Torsade points were observed during the therapy. There are limited date regarding the effect and safety of the long-term administration of intravenous amiodarone for neonates. To the best of our knowledge, our case represents the longest record of intrarvenous amiodarone for a neonate to control arrhythmia. Surgical options include complete tumor resection, mass debulking. For large tumor induced univentricular physiology, modified Norwood procedure or transplantation is alternative approach but it showed variable outcomes. , Recently, Freire et al., reported two success case of hybrid procedure (bilateral pulmonary artery banding, ductal stenting and balloon atrial septomy) followed by second-stage univentricular palliation for obstructive neonatal left ventricular tumors. This approach has the advantage of being less invasive initial intervention and the options of second stage univentricular palliation, conversion to biventricular physiology in case of tumor regression, planned surgical resection, or transplantation. We also performed bilateral pulmonary banding as initial palliation. Because ductus patency was maintained by prostaglandin E1 infusion and size of atrial septum defect was enough to maintain univentricular physiology, we have not done ductal stenting and atrial septomy. Unfortunately this patient suffered from NEC which resulted in death due to multiple organ failure after the procedure. We thank all physicians and surgeons in our institute, especially Takeshi Konuma, Goki Matsumura, Eriko Shimada, Tokuko Shinohara and Osamu Segawa, who collaborate for treat this patient. 1. Black MD, Kadletz M, Smallhorn JF, Freedom RM. Cardiac rhabdomyomas and obstructive left heart disease: Histologically but not functionally benign. Ann Thorac Surg 1998;65:1388-90. 2. Elderkin RA, Radford DJ. Primary cardiac tumours in a paediatric population. J Paediatr Child Health 2002;38:173-7. 3. Stiller B, Hetzer R, Meyer R, Dittrich S, Pees C, Alexi-Meskishvili V, et al. Primary cardiac tumours: when is surgery necessary? Eur J Cardiothorac Surg 2001;20:1002-6. 4. Bouillon T, Schiffmann H, Bartmus D, Gundert-Remy U. Amiodarone in a newborn with ventricular tachycardia and an intracardiac tumor: Adjusting the dose according to an individualized dosing regimen. Pediatr Cardiol 1996;17:112-4. 5. Mehta AV. Rhabdomyoma and ventricular preexcitation syndrome. A report of two cases and review of literature. Am J Dis Child 1993;147:669-71. 6. Isaacs H Jr. Fetal and neonatal cardiac tumors. Pediatr Cardiol 2004;25:252-73. 7. Freire G, Jureidini S, Schowengerdt KO, Rahimi B, Tinker K, Fiore AC. Hybrid procedure for obstructive neonatal left ventricular tumors. Ann Thorac Surg 2010;90:2057-9. 8. Thachil A, Saxena A, Choudhary UK, Ray R. Primary primitive neuroectodermal tumor: An unusual cause of right ventricular intracavitary obstruction in a child. Ann Pediatr Cardiol 2008;1:147-8.